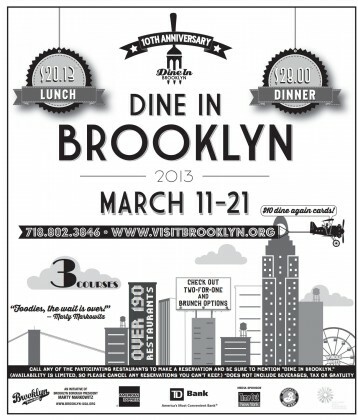 The 10th anniversary of Dine in Brooklyn week launches Monday through the 21st, with 200 area restaurants serving prix-fixe dinner for $28, lunch for $20.13 and 2-4-1 deals. Among Brooklyn Heights destinations, the following are on the menu… It is recommended you call and mention “Dine In” to find out specials and make reservations. Bon Appetit!